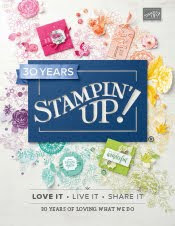 Just Julie B's Stampin' Space: Schoolhouse Book GIft Set! Get ready for Back to School with this fun and festive gift set for your favorite teacher and/or friend! You’ll make a Faux Book, with a secret slide out drawer that holds a stack of note cards. The inside of the book holds a special message as well! 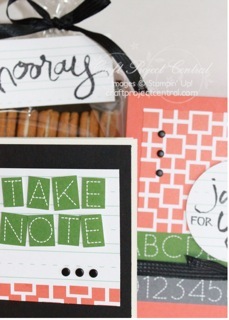 You’ll also make a simply Covered Pen, to smoothly write out all those little note cards. The Treat Bag is a perfect way to show off a sweetly wrapped snack – and you’ll learn the exact measurements to neatly fill out our Gusseted Cellophane Bags. And, finally, the simple but sweet card tops it all off as the complete gift! This fun and scholastic gift was made by ME!! You can get my tutorial when you subscribe to the month of August over at Craft Project Central. Box of Bangles Gift Set! Gift Bag Punch Board Creations! Farmer's Market Produce Stand Ensemble!